Our very own branded Rapid set Post Mix concrete is available to buy directly from us either as a bag quantity or in full pallet loads of 60 bags. 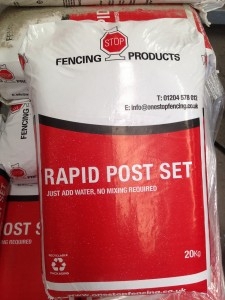 One Stop Fencing Products Ltd rapid set Post mix is perfect for any fence erecting jobs as it sets in around 10 minutes and is easy to apply. Rapid Set Post Mix is supplied in showerproof recyclable plastic bags enhancing eco-friendliness. We recommend 2 bags per post. Please note for full pallet deliveries the customer must ensure they have offloading facilities. Please contact the store on 01204 578012 for availability or any further information you may require.